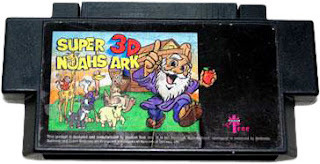 The Digitized Ramblings of an 8-Bit Animal: Super 3D Noah's Ark Is Back...And It's A Cartridge!!! As I have not seen these cartridges for a long time, I last saw them in my childhood when we were playing with my brother. The game is pretty easy and it's nice to play it with a partner. This game is pretty old, but many little ones love to play this game! Thank you for the information! I am pleased to have found it. I had had such a cartridge. that was fun.